Investment arbitration is rife with questions about justice. For example: Is it just to allow foreign investors to bring arbitral claims against states – especially when neither domestic investors nor persons other than investors aggrieved by state actions have any comparable access to arbitration? Do investment tribunals do justice between the parties? Do investment tribunals do justice to nonparties and, especially, the public interest? Are the particular forms and procedures of investment arbitration just? It is possible, however, to defeat the objection that investment arbitration unjustly exists only (or even largely) for the benefit of large, foreign corporations. In one recent article (Law and Development Review 2014, http://works.bepress.com/perry_bechky/5/), I argued that similarities between concerns central to investment and human rights cases warrant convergence between the two adjudicatory regimes, as suggested, for example, by the fact that the European Court of Human Rights hears property cases. In another recent article (Vanderbilt Journal of Transnational Law 2012, http://works.bepress.com/perry_bechky/1/), I criticized the so-called “Salini test” for jurisdiction on the ground that it unjustly limits access to investment arbitration by placing a special burden on smaller businesses. This talk builds on my prior work by proposing a small claims facility for the International Centre for Settlement of Investment Disputes (ICSID). It describes how such a facility might work and why it furthers the cause of access to justice. Importantly, it also discusses how such a facility (like other small claims mechanisms) might create tensions with other justice-based concerns, such as due process for the parties and concern for the public impact of investment arbitration, and how to manage such concerns to find a healthy balance. This talk is timely because the Secretary-General of ICSID has said that she is working to propose a small claims mechanism. 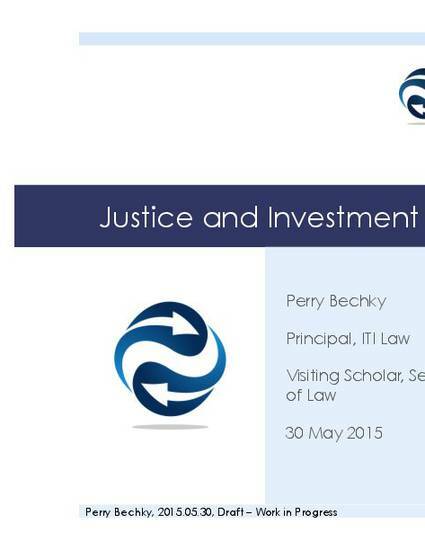 I presented this talk on 30 May 2015 at the University of Essex at the annual meeting of the British Branch of the International Law Association. It is a work in progress and your comments are welcome. The Powerpoint slides accompanying the talk may be downloaded here.